It has been a while I was in Zurich and to be honest I had kind of forgotten how nice the old part of the city is! Along the river Limmat which commences at the outfall of Lake Zurich, one finds several churches which just beg to be photographed! The image below of the Fraumünster church along the Limmat river is a 7 shot HDR (High Dynamic Range) image. While this was one of the first images I shot that afternoon, I continued well after sunset for some interesting night images. Zurich, now has its dedicated gallery on the Bjorn Moerman Photography site. Please make sure you check it out here. 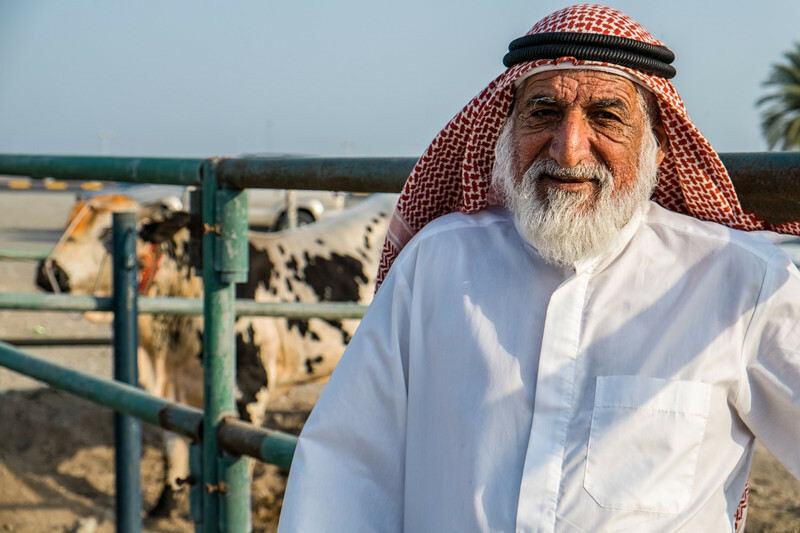 Even though, Sharjah is the third largest Emirate in the UAE after Abu Dhabi and Dubai, a lot of people outside the region have never heard about the place. Found just to the North of Dubai, Sharjah the only Emirate that has two coastlines; the Persian Gulf to the West and the Gulf of Oman to the East. In the region it is especially known for it education with a university campus that has a lot of interesting architecture, stretching over 5 kilometres (3 miles). The image below of one of the buildings of the University of Sharjah, was taken just after sunset after I got lost in the very busy city centre a while ago. 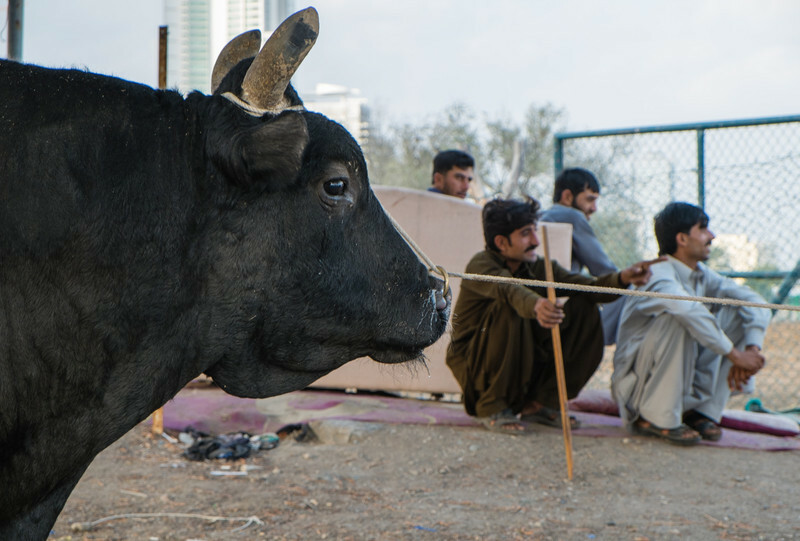 More images of Sharjah can be found here. Just finished a great aviation eBook, written by Australian Pilot/Author Owen Zupp. 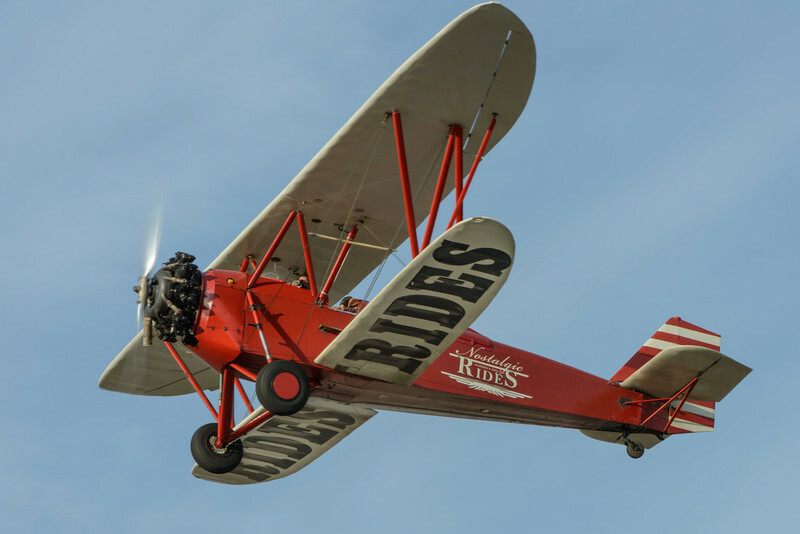 "50 Tales of Flight", takes the reader aloft in everything from biplanes to Boeings as the tittle may suggest. From the alarm clock buzzing to begin the airline pilot's day to the sound of silence when the engine fails and all that lies beneath are trees and cliffs. One chapter of the book is about one of the most exciting airports in the US; not because of its scenic approach, cheap fuel or great food at the airport restaurant; but because of the number of exceptional people and aircraft based there. 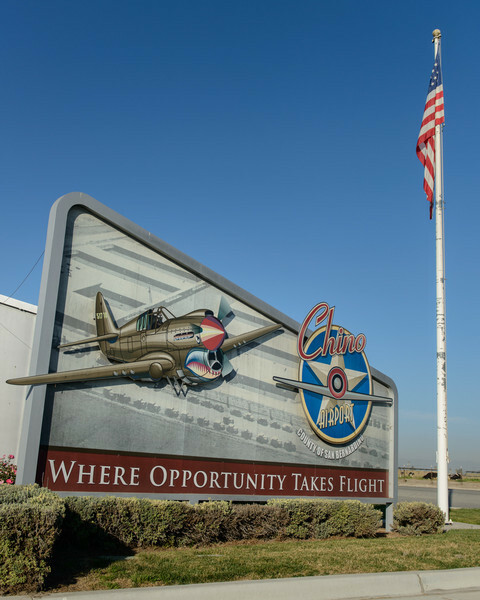 Chino (CA), is an airport with a soul, a place where opportunity takes flight! As I recently visited Chino on an Aviation Photography trip around the Los Angeles area; Owen gladly accepted for me to quote part of the chapter. So all of the text below is his. Please make sure that you pick up a copy of "50 Tales of Flight" here, if you like what you read. Enjoy! 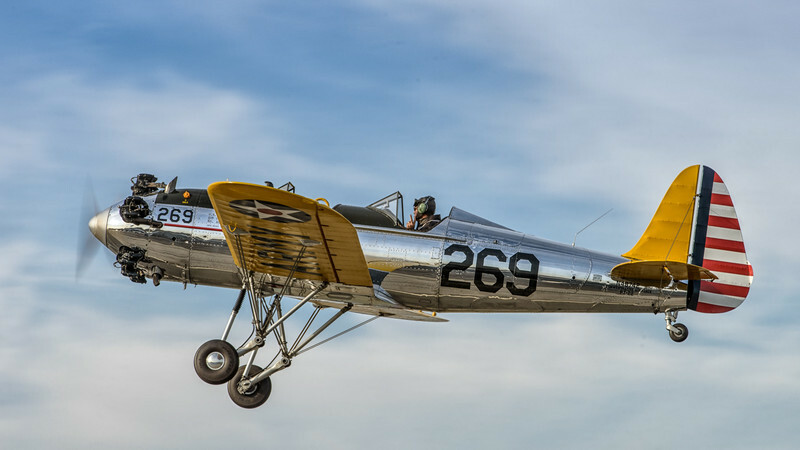 “As settings go, the warbird enthusiast would be hard pressed to beat Chino Airport in southern California. Forty minutes from downtown Los Angeles and nestled amongst rural properties, the airport has a backdrop of snow-capped mountains which exist in perfect harmony with the warming influence of the Santa Anna breeze. An absolute setting of nature at its finest, yet at any given moment the peace can be shattered in the nicest possible way; by the awe-inspiring roar of an aircraft from a bygone era, refusing to go silently into history. The time warp can begin from the minute you drive into Chino. Tucked between hangars and huts sits Flo’s Dinerhttp://www.owenzupp.com, an absolute must for any visit to the airfield. Behind the old screen door waitresses hustle about with pots of coffee as jacketed pilots, engineers, and enthusiasts hunch over the nearby counter. The coffee is black, the eggs are over-easy and the menu keeps cardiologists in business. The walls are all but hidden by yellowing posters proclaiming support for ‘Our Boys’ at war and an array of photos portraying long gone men and machines. The background hum of conversation sits well with the bustle of laden trays and creates an atmosphere that has seemingly remained unchanged for over half a century. Flo’s is more about character than cuisine. 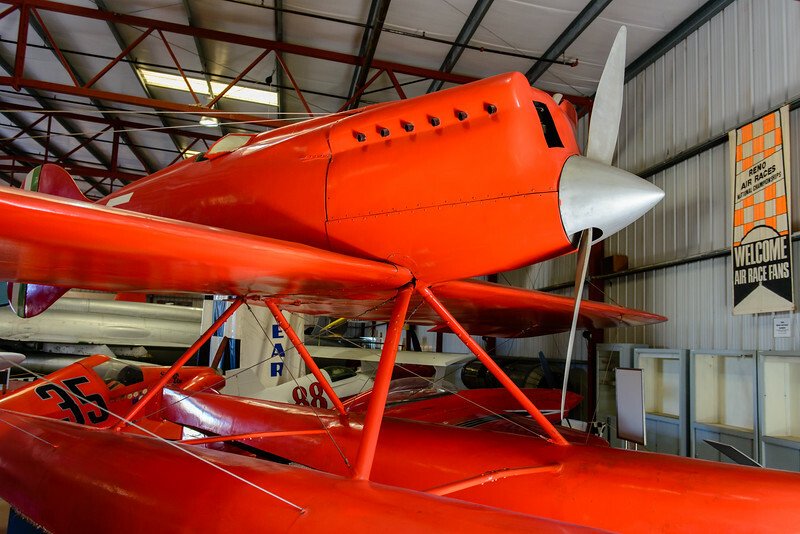 It’s best to breakfast at Flo’s as lunch won’t leave you with adequate time to dawdle through the two major museums at Chino; ‘Planes of Fame’ and ‘Yanks’. The former is synonymous with the airfield, whilst Yanks is a relative newcomer, though no less impressive. 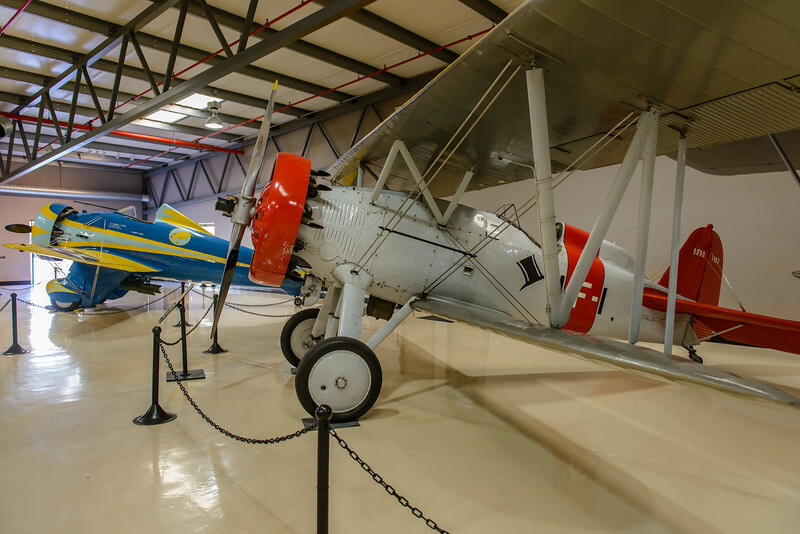 Both are a treasure trove of aircraft that date back to before World War One, though the roaring piston engined aircraft of the second major conflict definitely make up the bulk of the collections. 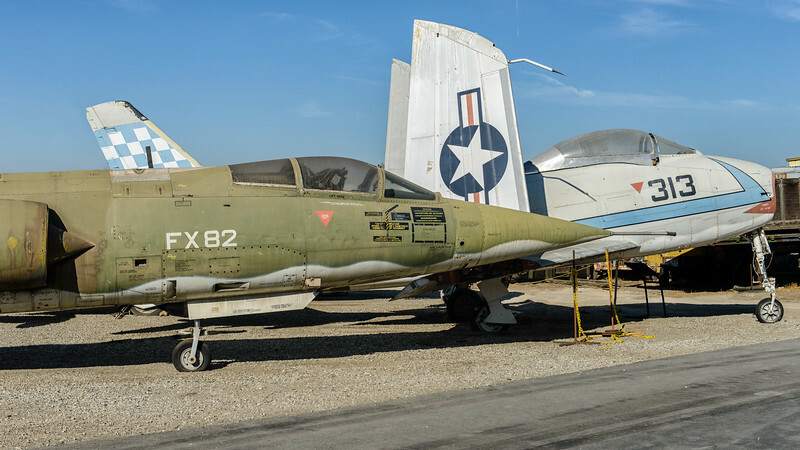 In company with the early jet fighters, the aircraft are not simply museum pieces and there are many living, breathing and flying examples that cast off the shelter of hangarage and show their wares at a variety of air shows throughout the year. For the fiscally advantaged, there is even the opportunity to back-seat in a P-40 Kittyhawk, or some similar machine. There is so very much on offer. 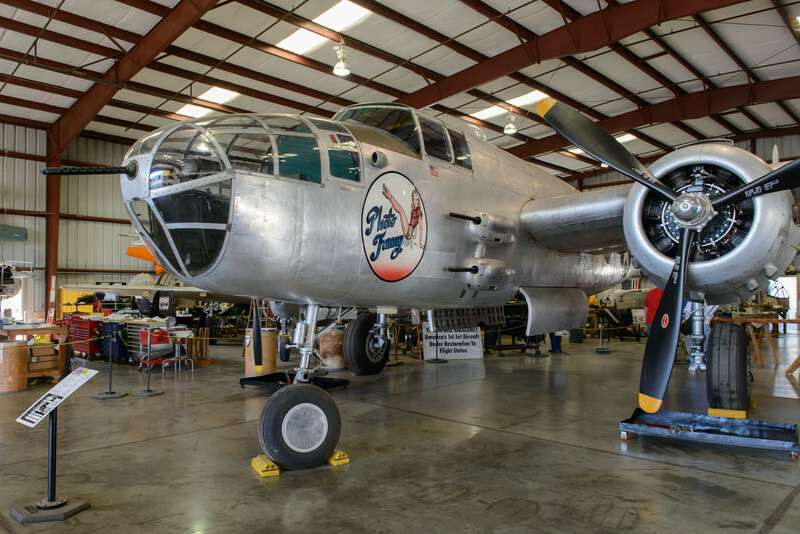 The long established, “Planes of Fame” museum welcomes you with a four-engined Flying Fortress on the front lawn. 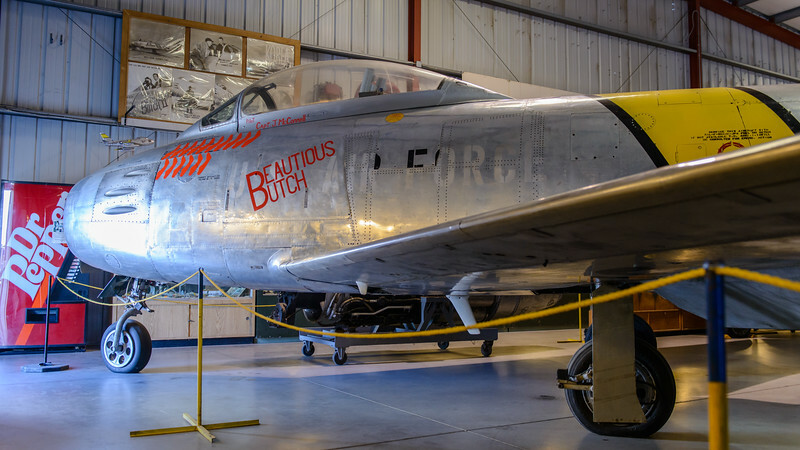 Aircraft from the earliest days of military aviation through to a specifically designated “Jet Hangar”, feature static and flying examples of a vast range. 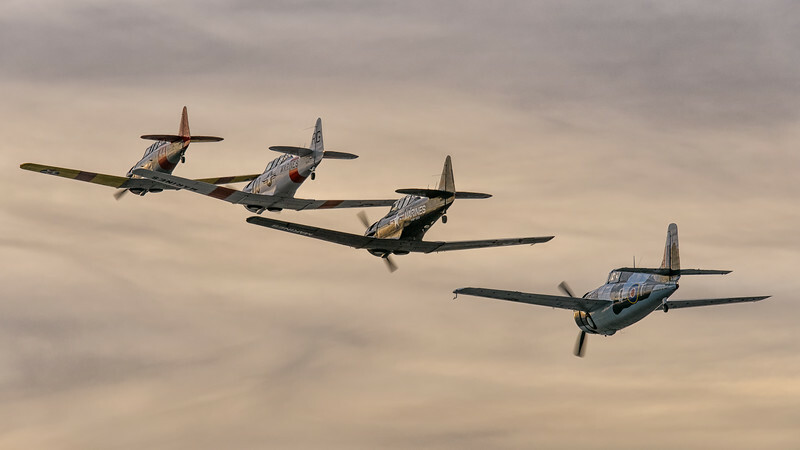 Many of the flying examples have made the trek to the bright lights of nearby Hollywood and starred in such films as Pearl Harbour. 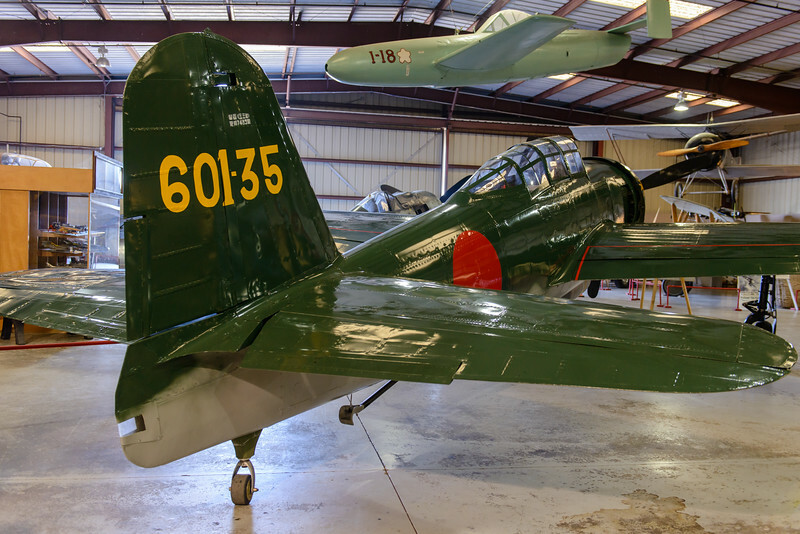 Conveniently, the tremendous collection of Japanese aircraft allowed the “Planes of Fame” to participate in both sides of the battle. One such example, the Mitsubishi Zero, transcended the celluloid in times past and flew in actual combat over such Pacific islands as Iwo Jima and Tinian. Wandering amongst the maze of hangars, all manner of aircraft can be encountered. They are from all continents and each come with their own history. French Ace Charles Nungesser’s WWI biplane, a Canadian Spitfire from D-Day or an F-86 Sabre from Korea. The list is all but endless. A particularly attractive display sees the US Navy carrier-based contingent hangared in a style reminiscent of the USS Enterprise. Wings folded and crammed in, the sense of an aircraft carrier is tangible. Complete with side railings, semaphore flags and a shiny deck, the portholes are filled with a treasure chest of nautical memorabilia. It’s a time warp within a time warp. Like Santa’s workshop with rivet-guns, a number of the hangars are dedicated to renewing or extending the life of these fine machines. Jigs, paint-shops and engine-trestles fill every corner to restore these stallions above and beyond their former glory. In one such hangar sits a forerunner of modern day ‘stealth’ technology. 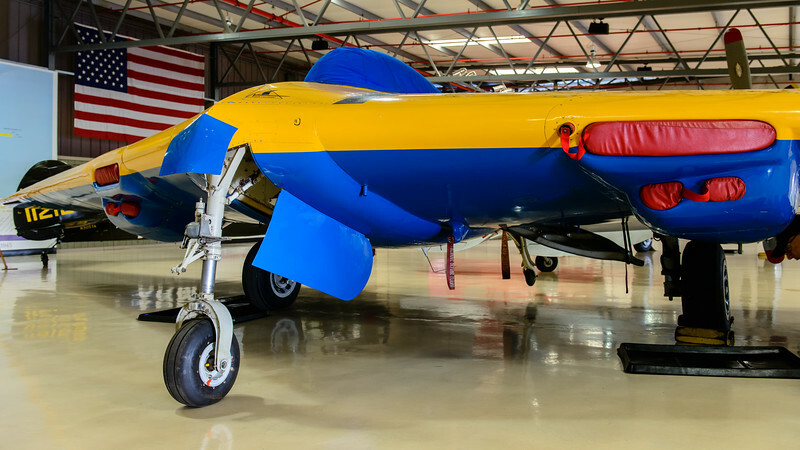 The Northrop N-9M is one of a kind, an original flying wing that harks back to the 1940s. Designed as a 1/3 scale flying example of a larger bomber, the N-9M was piloted by a lone pilot and used to prove a unique aerodynamic theory. Whilst its larger brethren did eventuate, it failed to go into major production and it would be decades before the concept was successful in the modern generation of stealth warriors. The museum’s flying wing still takes to the sky and is another example of living history, rather than the dusty cabinets that characterise some collections. Chino is all about such history. Perhaps its greatest assets are not merely the hardware, but the stories that the aircraft have brought with them into a new century. Furthermore, by keeping these aircraft flying it allows the sounds, smells and sense of speed of a bygone era to still be with us today. It was a time before wide-bodies and fuel efficiency; it was about pulling ‘G’ and unadulterated ‘grunt’. Somehow static displays don’t quite capture that. 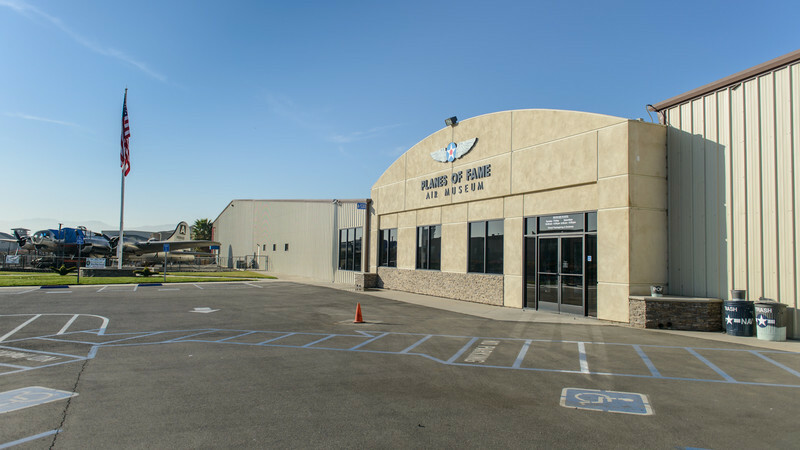 Chino is a step back into history and the origins of aviation. Whilst somewhat removed from modern civil aviation, it is a place filled with interest; of fascinating aircraft and the tales of the people who crewed these amazing aircraft. If after taking in the sights and sounds you’re still feeling a little unfulfilled, don’t forget, there’s always coffee and flapjacks at Flo’s"
As I wrote in my last Pic(k) of the week - Beech 18, I attended a very interesting small airshow near Los Angeles (US) last Saturday. 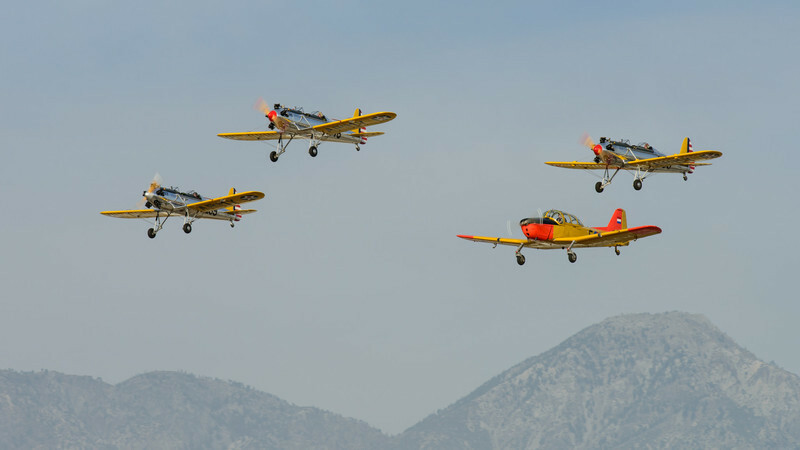 The 39th edition of the show at the "Cable" airport" near Upland California, is often been referred to as the "First airshow of the year" in the Northern hemisphere. Dewey and Maude Cable were the ones that started this private airport in 1945 and interesting enough the place is still fully owned by the same family. This makes it the "Worlds largest family owned public airport". The program of the yearly airshow ( they call it an air fair) which runs on the first Saturday and Sunday after New Year, consist of two parts; a morning one (09-12am) and an almost identical afternoon session (0100-0430pm). This way visitors get the see the events twice for the 10 dollar entrance fee. 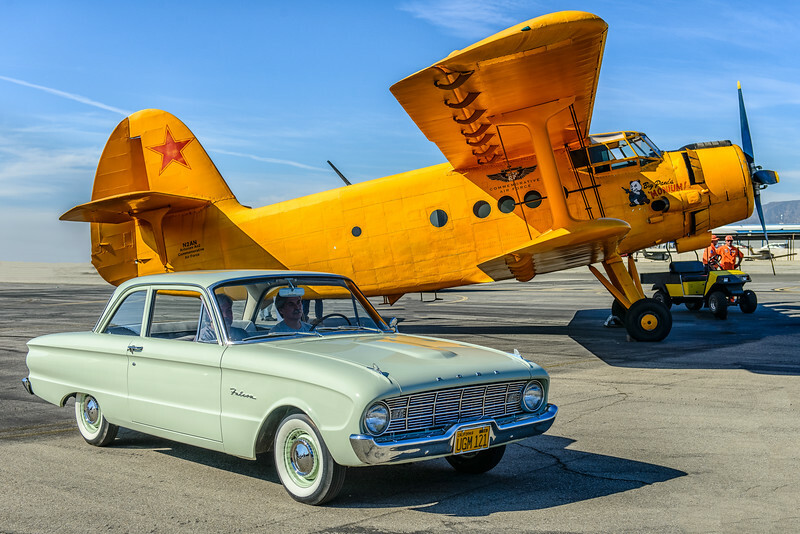 During lunchtime there is an extensive parade of old-timer cars which all pass in front of the aircraft participating in the airshow. What makes this show however extremely "photography friendly" is the fact that the sun is facing the back for almost the entire show and that the runway is only 50 meters (150ft) away from the line of spectators. Add to this the low angle of the winter sun, a beautiful mountain backdrop; and you have a dream setting for aviation photography! One could almost believe that some of the images were taken Air to Air ( from another aircraft in-flight). 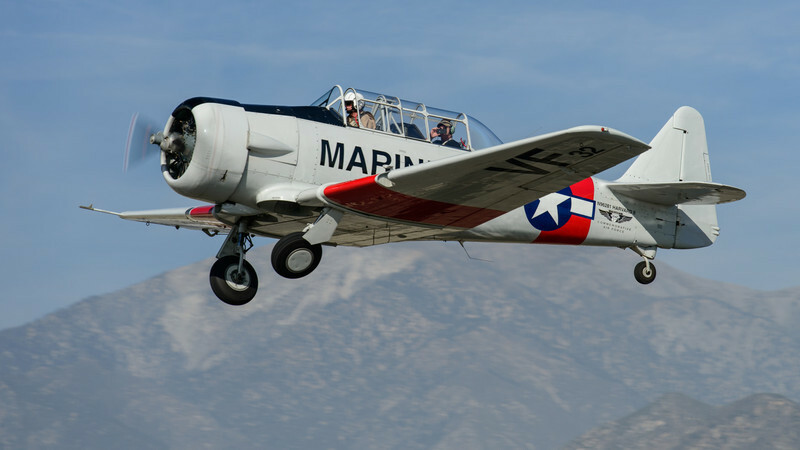 and nothing less than a T-6 Harvard warbird. This is not the show with noisy jet fighters or famous military aerobatic teams, but rather a good old family airshow where pilots and aviation fans just hang around! An act which took my attention was the one of the legendary aviation legend Clay Lacy (aged 81! ), doing an "engine out" routine in his Pilatus PC-6. 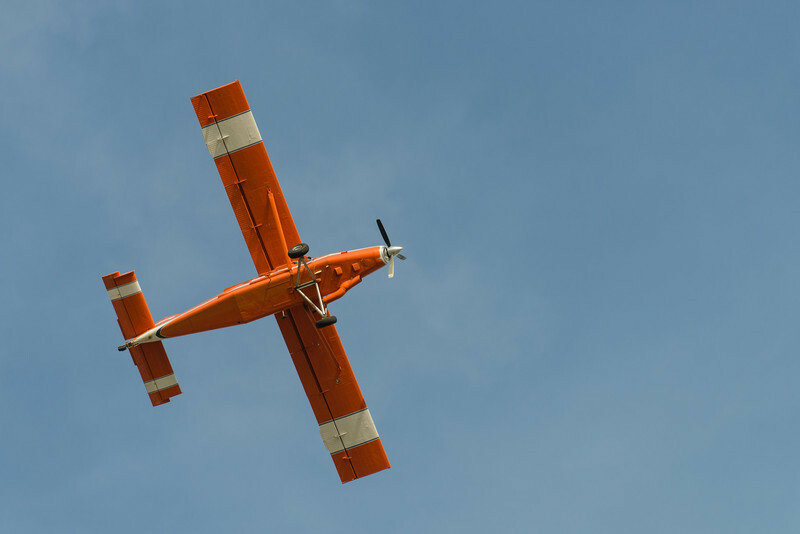 Call it Bob Hoover style, although not aerobatic! Talking about aerobatics, the only negative of the show, was the fact that the "airshow display line" was far away from the public. Likely not the fault of the organisers but probably imposed by the FAA (Federal Aviation Authority). On the subject of the FAA, they apparently billed the show last minute over 15.000 USD for an imposed hire of Air Traffic Controllers during the two days. When will these government organisations understand that these type of events often give a huge boost for aviation and that the money eventually will flow back into their pockets anyway? End of rant! Anyway, I was extremely happy I came down all the way from Dubai to attend the show and hope to be able to return for its 40th edition next year… Well done to the organisers! 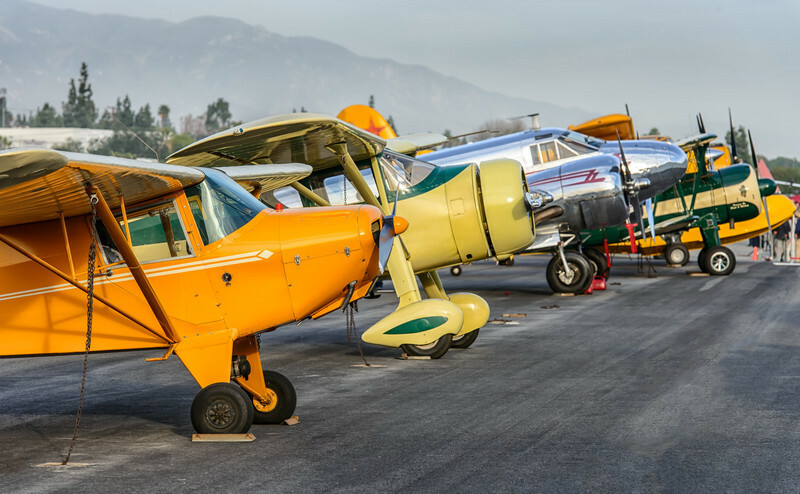 When it comes to "Aviation Photography", Southern California is probably one of the hottest places on earth; a mecca for aviation geeks like yours truly! 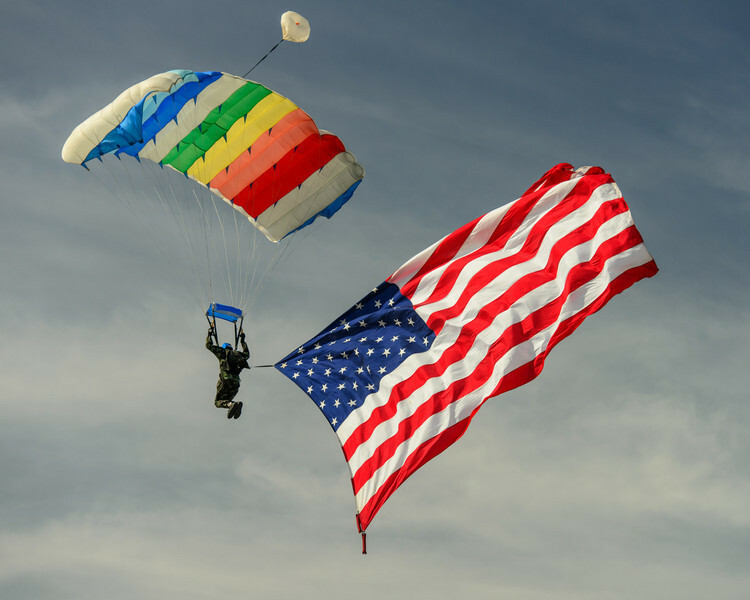 Last Saturday I had a day packed with Aviation fun in the Los Angeles area; the afternoon was spent at the 2014 Cable, CA airshow. An entire blogpost will be dedicated to this event in the coming days. For now, I would like to share one of my favourite images, of the event; a beautifully restored Beech 18, sitting in great late afternoon light. Nicknamed the "Twin Beech", the Beech 18 holds the record for the piston aircraft being in continuous production for the longest time; first one was produced in 1937 while the last one went to Japan Airlines in 1970; 33 years later ! 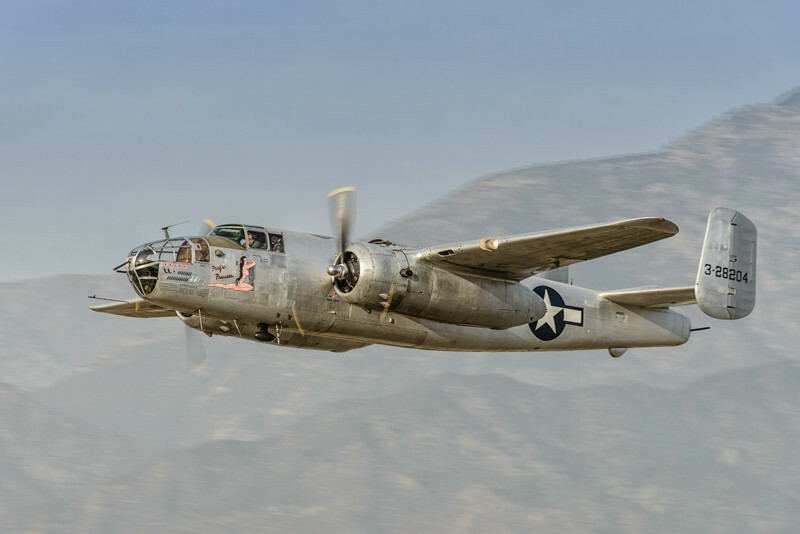 While it was initially used as a US military transport and training aircraft during World War II, later versions were also used in all kind of civil roles; from small airliners, through cooperate aircraft, to skydive and other utility aircraft. Often confused with the lookalike Lockheed Electra 10 (and 12) which was flown by legendary female pilot Amelia Earhart, the Twin Beech was a far more successful aircraft when it comes to the number of aircraft being built; almost 8000 came of the production line. There are still plenty of Beech 18's taking to the skies, mostly in the hands of aircraft collectors. Check out Twin Beech.com for one of the best sites on this great vintage aircraft! Unfortunately, I do not have the registration of this specific aircraft and can't give you the history of the specific airframe. If anybody can help me with this, I would appreciate a quick email or comment below. Those of you that want to have a sneak preview of some of the other images shot at the Cable airshow , can find the gallery here. Remember: "Aviation is not so much a profession as it is a disease". 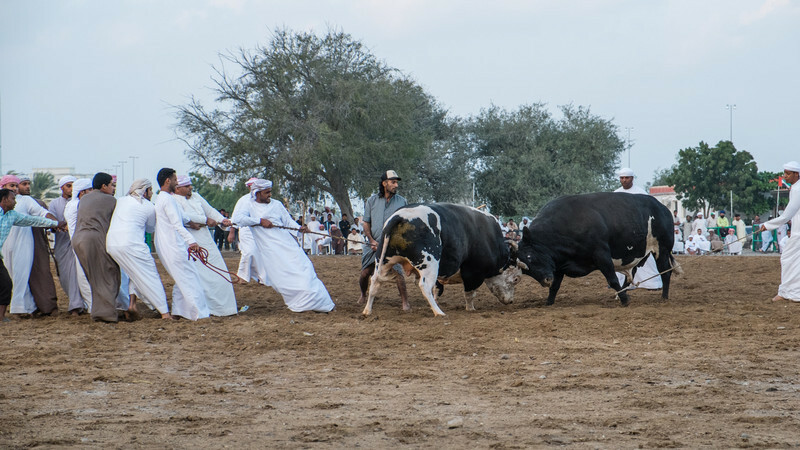 End of last year, I attended my first Bull Fighting / Butting event at the East coast city of Fujeirah, about 1h 15' from Dubai. 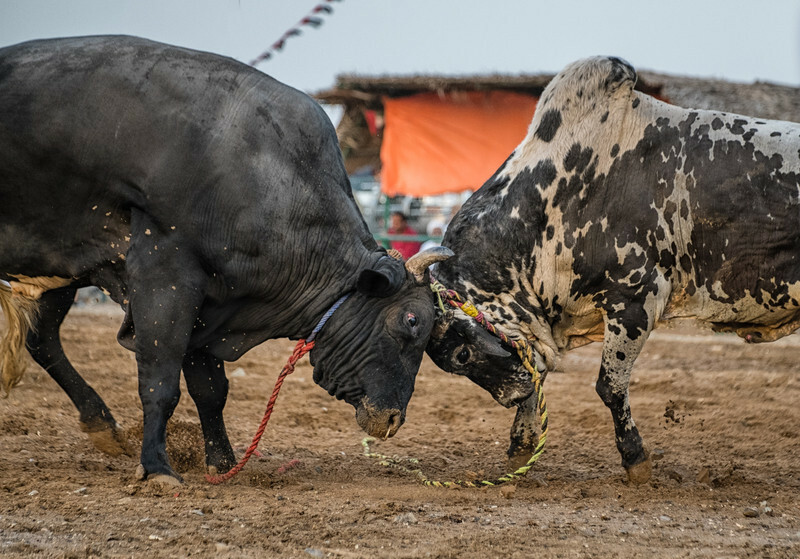 First of all, I must stress that this is very different from the classic Bull Fighting in Spain and some of the other Southern Mediterranean countries. That is where the name "Bull Butting" comes into effect. There is no blood shedding involved and the animals all walk out alive. The origin dates back to the 17th century and was introduced by the Portuguese who once colonised the area. The free event is held every Friday (except for the Summer months), on an open space opposite the Corniche in Fujeirah and starts about 1 hour before sunset. 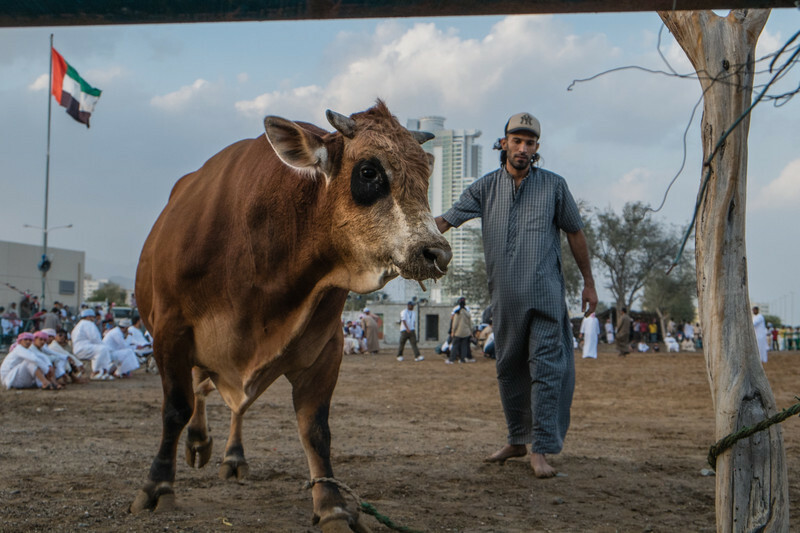 Participants from all over the UAE bring their Brahman bulls, weighing close to 1000kg to Fujierah. Two at a time, the bulls are then brought into a large area of sand. Once released they start "pushing" (butting) each other. 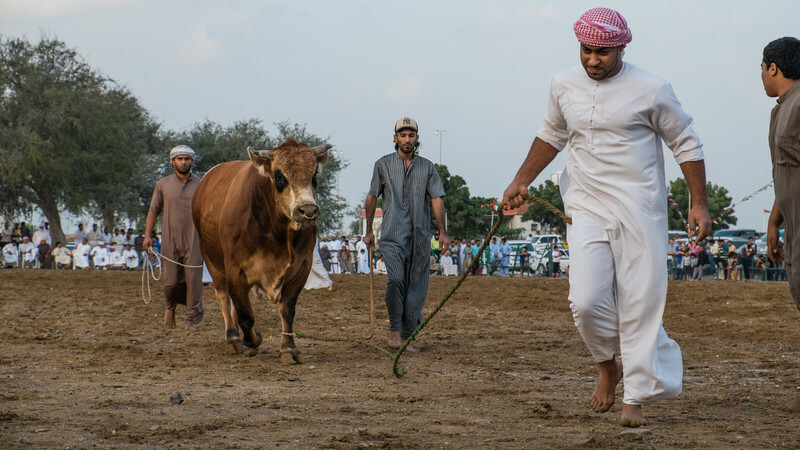 After a few minutes only, a judge declares the winner who was able to push the other animal backwards the furthest. 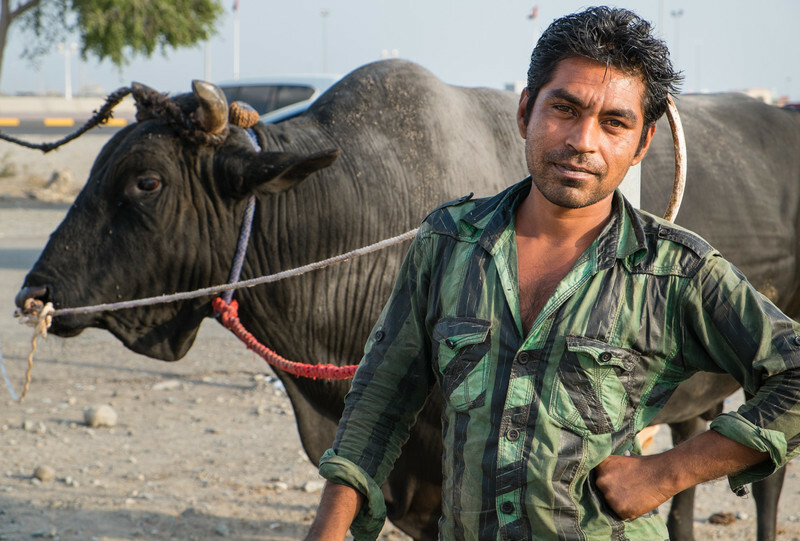 A team for every bull then "pulls" the animals apart. Beside the actual "butting", I found it to be a very social event with plenty of people photography opportunities! 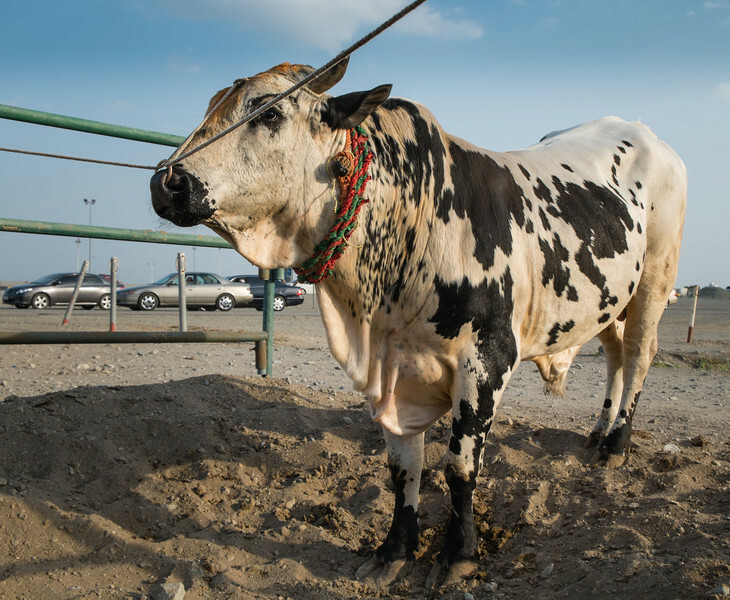 If you want to do something different on your typical lazy Friday ( day off in the UAE ) afternoon, a quick trip to the Fujeirah Bull Butting is worth it! A gallery with all images of the event, made with the Fujifilm X-E1, can be found here. Whatever you do, wherever you are; "have a great weekend" ! Star Trail photography has been on my mind for a while now. Finding a dark place to do this type of night photography in the UAE is always a challenge. 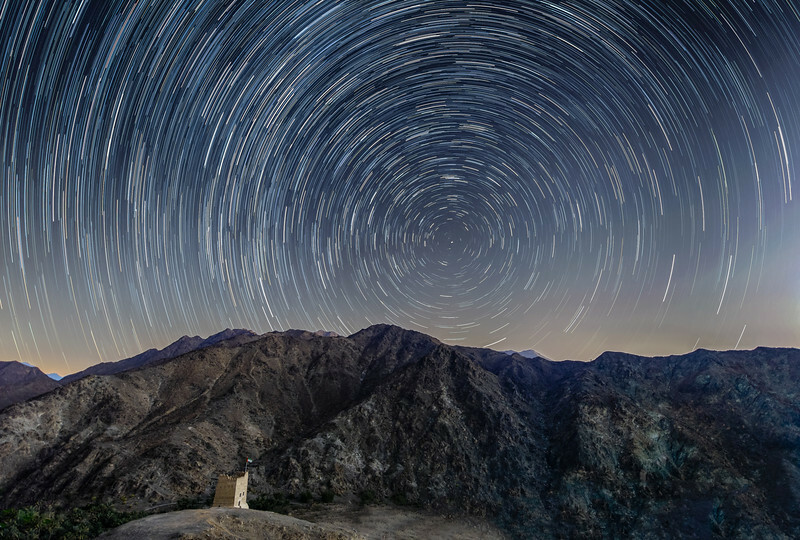 While searching for a place without light pollution, Dubai photographer Ajith Gopinathan, was the one that brought me to the Al Hayl fort near Fujeirah (UAE). 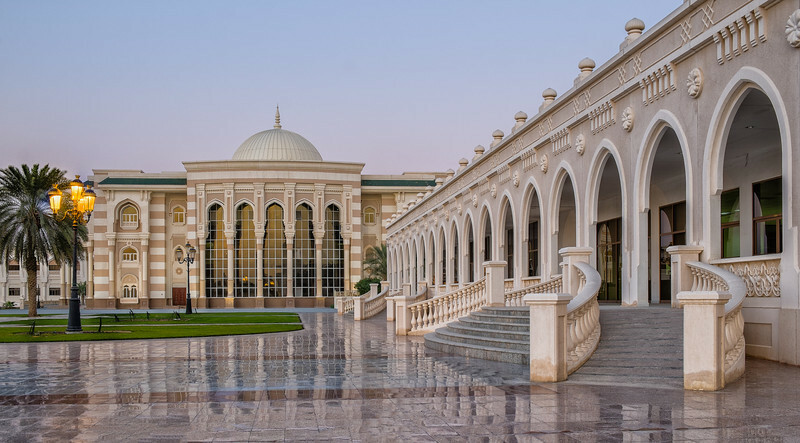 Just over an hour drive from Dubai, Al Hayl village is located about 20 km off the main new road between Dubai and the city of Fujeirah at the East coast of the UAE. The area, surrounded by mountains, has an interesting fort dating back to 1830 and a few oasis's at the end of the valley. While exploring we discovered that the fort was lit by several powerful halogen lamps at night. Exactly the opposite what I needed for star trail photography! After a bit of socialising with the watchman, who lives on site, we managed to ask him to shut off the lights later a night. While we couldn't complete our night photography shoot that particular night due to clouds drifting in, I managed to return myself the following day. Clear skies and moon which had just set, made for pretty much perfect conditions on day 2. After I asked the watchman to switch off the lights at 9pm (sunset was just after 5pm), I was surprised that there was still a little bit of light at the North Eastern horizon; clearly the result of the street lights of the city of Fujeirah which is quite some distance away. The most difficult part of the shoot was probably climbing a steep hill covered with loose rocks and small gravel. When one wants the nice circular motion of the stars as in the image below, we need to aim at the Polar star (North star, officially called Polaris) , due North. There are plenty of useful astronomy iPhone/iPad apps out there and the one I use the most is GoSkyWatch Planetarium. The resulting image below was shot over a 50 min period and consists of 100 x 30s exposures blended together as well as a single 3 min exposure for the foreground. After doing some test shots using manual exposure and manual focus, it was time to start the sequence of 30s exposures using a cable release. From then onwards, it is mainly hanging around, keeping warm and waiting… I recommend placing the tripods and cameras slightly away from the photographer as all light used while waiting, will somewhat contribute to the light pollution. I did shoot a total of 6 different images that night, using both my Nikon D800 and the Fujifilm X-E1. Even though I thought the Nikon would be more up for this task, I see very little differences in the resolution and the amount of noise in the resulting images. Totally unexpectedly, with the screen turned off, the X-E1 battery lasted even longer than the D800 one. A few more Star Trail images from this night can be found here. As I'm a relative novice when I comes to Star Trail photography, I watched some online videos on the subject. The one I found most interesting was Steve Perry's " How to photograph Star Trails" Youtube video. Thanks Steve for sharing!